I was at Target doing some back-to-preschool shopping and I couldn't find a cute dry erase board (which was a strange feeling for Target, I usually always come out with at least $100 of cute stuff I never knew I needed). Then I realized I could make my own with an IKEA frame! I feel kind of guilty even calling this a tutorial because it's really pretty easy but here goes - I used one of the bigger (almost 12x16") frames and I used the paper from the inside as my cutting guide. Cut some of your favorite fabric and pop it in the frame - I promise I ironed this even though it looks crazy wrinkled. These frames are about $4 at our IKEA. Voila! A completely customized dry erase board for under $10! I will tell you that I took the protective plastic film off before writing on the plastic that covers the framed fabric. I also have learned that while cheap the IKEA dry erase pens don't wipe off very well if you leave them on for more than a few minutes, so "splurge" on a better dry erase pen. I like Crayola ones. You could even get all crazy creative and do some fancy patchwork or embroidery to frame - what can I say, I'm an over-achiever (BWHAhaha). Harper has been loving this for drawing and I've been using one for a WIP list in the craft room. I love that I can use any fabric and can change it any time. 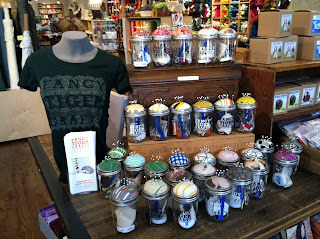 I almost wrote up a "summer manifesto" at the beginning of the summer, something along the lines of what Erin at House on Hill Road did for her Spring Manifesto - just a lovely list of things she hoped to savor and accomplish, enjoy and create. I'm a big believer in journalling and the magic that comes with writing things down. But time got away from me (if you've met my non-stop kid, or have a toddler of your own, I'm sure you understand) and it just didn't happen. I love the idea and I'm definitely planning on doing it but this summer, well, this summer just kind of took it's own course. It turned into the summer of sprinkles (on our new love of frozen yogurt - or "ice cream" as Harper calls it), the summer of swimming at the pool with our BFF's and the summer of the Wiksten Tank Top. I also LOVE Elizabeth Hartman's Perfect Zip Bags pattern - this one isn't free but it is a bargain for all the great photos and info you get. If you're looking for inspiration check out all the beautiful work in the Pretty Little Pouch group on flickr - so much great sewing going on! - no sign-ups, make a pouch and get a pouch - it's going to be that easy! - I'll find a space and time for the swap as the Summit gets closer and post the details here and in the google group Erin set up. I was a little bit stumped when Debbie over at A Quilter's Table announced that August's theme would be the Herbal Table - I mean I'm much more of a "dessert" or "pasta" table kind of girl ;-) But then it occurred to me that might be a great opportunity to actually use some of the herbs that have been growing like crazy in our little herb patch. Even though the green thumb that runs so strong in our family apparently skipped me, it landed with full force on my daughter who loves to dig in the dirt and water things. She's also obsessed with compost - at not quit three. Nutty, right? But anyway, we started a little herb garden in the courtyard and it has taken off. Plus I accidentally propagated (thanks for the new word Mom!) a couple new basil plants quite by accident by leaving the cuttings in a cup of water in the counter. So we have a LOT of fresh basil to use. So I decided to make Alton Brown's Tapenade recipe and try to re-create some veggie sandwiches I swear I saw in Martha Stewart's Everyday Food. The slight changes I made were: I used a 12oz jar of kalamata olives from Trader Joe's, rinsed along with 2 tsp. of anchovy paste, 1 tsp. freeze dried minced garlic (I love this stuff, never goes bad, saw close as you can get to fresh) and I didn't have any capers so I added a Tbsp. of balsamic vinegar instead. Plus all the other ingredients the recipe called for and a minute or two in the food processor to make a paste (spread?). Then the yummy sandwich! Whole grain bread (also from Trader Joe's), a layer of hummus, grated carrots, thin sliced cucumbers and then the tapenade. I'm am SO not a veggie person and this was absolutely delicious! You could always add a little goat cheese too and my husband thought it was easier to eat open-faced. The fresh basil added a lovely fragrance to the tapenade and I'm sure we'll be putting this into the regular rotation. I'm thinking about changing my blog name to "the bag lady" or maybe "bag obsession" or maybe not. You get the idea though. This bag makes me so ridiculously happy. Big enough for all my things (which honestly kind of hang out a little lonely at the bottom) PLUS a change of clothes for Harper, a water bottle, teddy bear, snacks...you get the idea. Plus I love the cross body style bag. 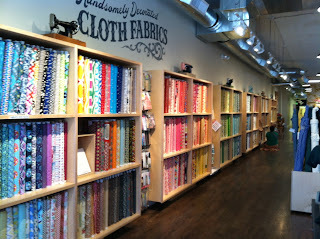 So it's fabric love and design love and well, I love it. Teehee. So the exterior is Clippings from Loulouthi (I think you can still find a little on etsy). The contrast is Hello Luscious By Basic Grey for Moda and the interior is Essex linen in natural. The pattern calls for lining with duck cloth and I like how that feels but my machine hates to sew through all those thicknesses so I used shapeflex on all the interior and exterior pieces and it's a good compromise. Enough weight to feel substantial enough but my machine still sewed it all easily. I ended up making the top bands about an inch longer than the pattern called for when my first ones were too short. This is probably something I did with the pleats BUT I will cut the tops bands at least an inch longer from now on and then cut them to fit once the bag body is assembled. The strap starts out at 44" long and the direction is to adjust it to the length you like - I made this one 35" and it still fit easily over my head and I can reach the bottom of the bag while wearing it. Jen Giddens has several other patterns I'm planning on trying now - they seem well written and designed. She does not allow ANY sales of bags made from her patterns which surprised me a bit, it seems many designers will let you sell a small number that are handmade but not in this case. Bit of a bummer. Other than that I'm excited about these patterns! Would love to hear if you try any of them. 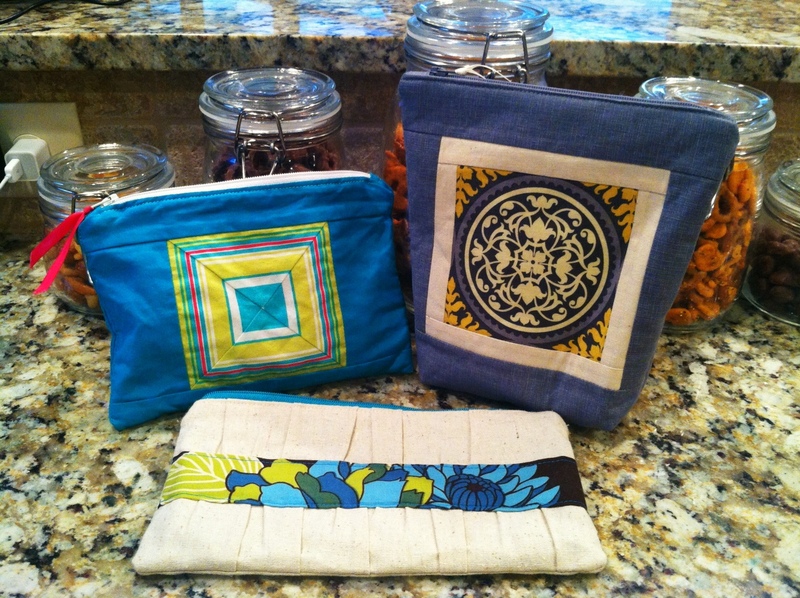 UPDATE: Jen just changed her shop policy and IS ALLOWING individuals to sell bags made from her patterns - yay! She also has a new zippered messenger bag pattern coming out which looks awesome - keep an eye out for it in her etsy shop! 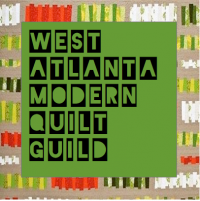 LOADS of things on my sewing to-do list: new quilt for Blend Fabrics for quilt market (wait until you see this ridiculously cute fabric! ), I'm suddenly obsessed with Malka's supersize shoo-fly quilt again, would love to use the beautiful Indie collection to make a KING sized quilt for our bed (am I crazy? maybe) oh and some back-to-school clothes for the doodlebug. So enough to keep busy :-) Oh and...a washi dress. Teehee! I ending with a question today: have you ever used voile for backing a quilt? Did you like it? How did it wear? Thinking about trying it for the bed quilt and would love any info/opinions if you're tried it already! Warning: photo heavy post! 2012 has turned out to be the year of the baby in our family, with both my brother and sister welcoming their first babies, one in May, the other (possibly) in September. So this was the 2nd baby shower at my house this year! A record that I can't imagine ever being beat :-) So I went with my sister's nursery colors as the shower colors. August's mini quilt - a disappearing 9 patch (just sliced it up and rearranged it in a way I thought looked good - if there is a "right" way, I don't know it!). These aren't colors I would normally choose together and I loved them - so sunny and bright. I used all the pieces I could from around the house, as well as some new pots from Ikea and a few choice vintage pieces that have been gifted to me from family. This lovely felt flower will live in Harper's room next month. I followed Not Martha's felt Dahlia brooch tutorial but glued the base circle to the yellow fabric before I attached the petals. 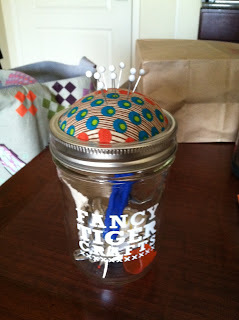 I used Fabric Tac glue to do the whole thing but I think I'm going to sew the next one - less messy. My Paint Something Workshop masterpiece! Vase and flowers from IKEA and vintage glass. Bunting that's back lit is terrifically hard to photograph. Made my own bias tape (even AFTER a trip to Hancock's to buy some. Ended up home with a pack double fold and a pack of single fold that looked EXACTLY alike. Thanks for that Coats and Clarke. And thanks to Hancock's for ALWAYS being in a state of disarray and half-stocked confusion. Aargh.) then I cut rectangles of varying length and pinned them to the bias tape while it was hanging to get the right placement. I did find the cute bird fabric at Hancock's which was a pleasant surprise. Harper said "it's SO BEAUTIFUL Mom" once it was done, so I'm not going to get higher praise than that, am I? We had food everywhere you looked. Special thanks to Target for having a whole summer line in the right colors that looked fabulous! You knew there would be cupcakes right? Chocolate buttermilk with peanut butter frosting. The BEST carrot cake with cream cheese frosting. I took a page from Gwen's book and bought these adorable fondant cupcake toppers from Apple Blossom Cupcakes on etsy, she was happy to do custom colors and I was thrilled with how they turned out. Everyone LOVED them and I was thrilled with how easy it was to get decorated cupcakes that were ridiculously easy. The pile of gifts was much larger but this was the sweet chenille bunny I found at a local craft fiar earlier in the year, in the nursery colors! Couldn't believe my luck! 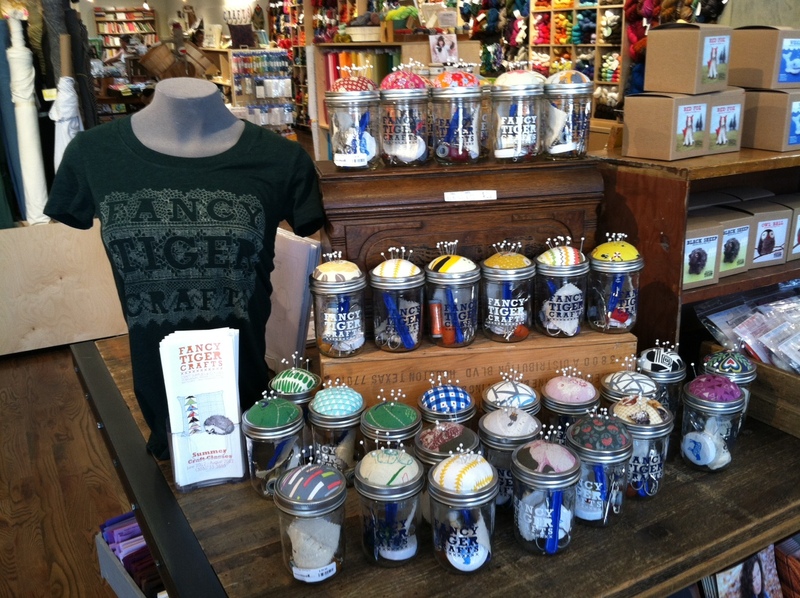 And those cute plastic berry containers from Target filled with some of our favorites. It was a fun day with family and friends and I think the parents-to-be left happy and full, as it should be. Now to meet that baby! 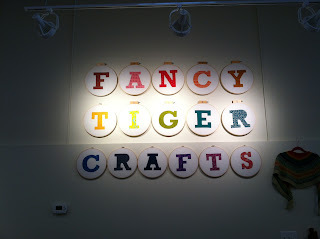 So when you go to Denver please please please put Fancy Tiger on your list. High on the list. Maybe on the list twice. It's that good. These are photos from my phone (not the best but you get the idea) that I took while walking around ooh-ing and aah-ing and touching everything and knowing I'd never be able to remember it all. 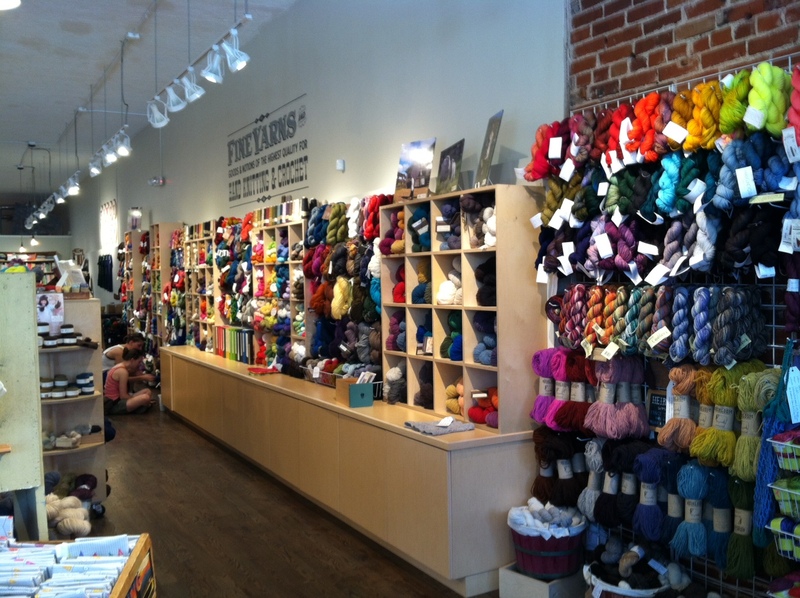 You walk in and see crafter's paradise spread out before you. Embroidery supplies, knitting, crochet, needle felting, spinning, fabric and more fabric and patterns galore...sigh. So much goodness in one bright happy place. This might be the worst picture of the most adorable thing ever - mason jar pin cushion/sewing kit. Just a great idea. Perfect souvenir! Even though I crochet pretty well I'd still like to learn to knit. Maybe some day when it's not 100 degrees outside. 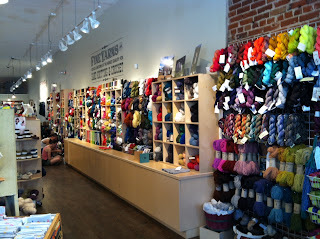 This also made me miss Knitch - is there another fun yarn store in Atlanta like it? If so please enlighten me! So we took a little family vacation when my husband finished up his long work trips. We thought it would be fun to relax and reconnect and check out a new city and when tickets to Denver went on sale we jumped on them. 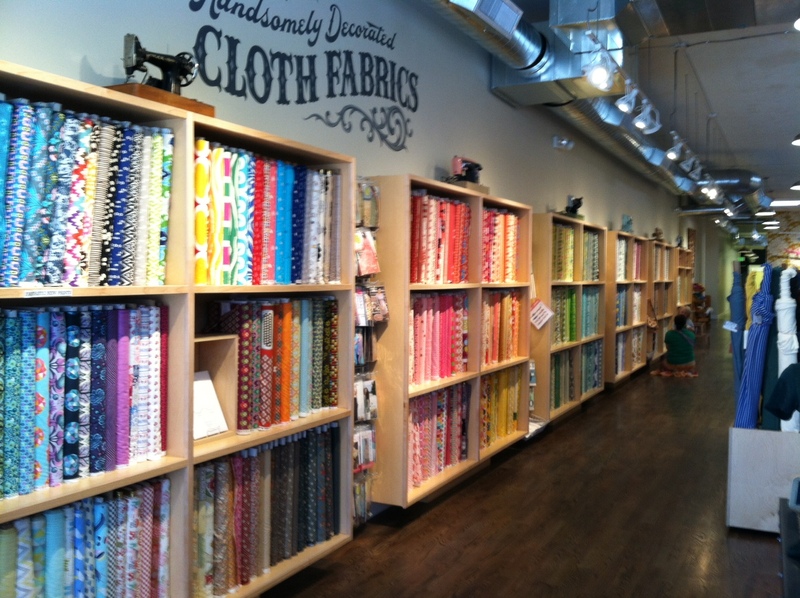 I asked Diana over at Whipstitch (who I swear knows everything) if she knew of any fun fabric/crafty stores in Denver or Boulder and of course she did. Thus began my love affair with The Fancy Tiger. When I saw their Market Tote pattern in this Melody Miller fabric it was love at first sight. Serious, must drop everything and make that, LOVE. I knew it was absolutely meant to be when Whipstitch still had a 3/4 yard piece waiting for me there in the store - the last piece. Whew. I wanted to take this on our trip and so I wanted it to be sturdy enough to carry my things and some of the extra 8000 things Harper normally wants me to carry. I used a heavy weight canvas for the interior on mine and added a little Loulouthi trim to the pocket and while my machine didn't love sewing through all the layers it turned out great. I used Shape Flex on the exterior print and carried it everywhere while we were gone. Then I made one as a thank you gift - the recipient loves orange and blue and I thought this gorgeous Amy Butler print would fit the bill nicely. Fun and summery, yes? This one was made from two quilting weight cottons and I only interfaced the exterior fabric and straps with Shape Flex (one of my two favorite interfacings). Still good but definitely lighter than the one made with the canvas interior. Love the contrast this pocket provides on the interior. Loved all the pockets on all of them actually. Finally a back-to-school bag for my BFF. I found this MM fabric in Denver and knew she would love this colorway. Even though the canvas gave a nice shape to the bag the colors available aren't that fun. I know you know what I mean when I say fun is important in a bag (teehee). So for this one I used a Kona that coordinated (almost) with the exterior. I interfaced everything with Shape Flex (including the straps) and it worked out so well - heavy enough to feel like it had a nice body but still easy enough for my machine to tackle without complaining. Another fun pocket from an exterior scrap! And I while am sad that school is right around the corner I am happy to report she loved it. Really truly loved it. It's so satisfying to make something for another maker who gets what handmade means and will use and appreciate it. How about tomorrow I share some of the pictures I took there? Just for fun! And I haven't forgotten the fabric folding pictures either!